Pencil, pen-and-ink and watercolour drawing by Frederick Charles Maisey of the plan and section of the Sita sej cave in the fort of Kalinjar. this drawing is taken from an album of 60 drawings, dated 1847-1854. Kalinjar, one of the oldest hill forts in India, occupies a remote site on the last spur of the Vindhya Mountains above the Gangetic Valley, a plateau 375 metres high. The site was originally a revered hill shrine later fortified and occupied by successive generations of invaders. It was an ancient Chandella stronghold from the 9th to the 15th centuries; it was later conquered by Akbar in 1569 and fell to Colonel Martindell in 1812. Within the fort there are numerous archaeological remains; Sita Sej is a small cave, with a stone bed and pillow once used by hermits. It is situated beyond the Bara Darwaza the main gateway of the fort. In his 'Description of the Antiquities of Kalinjar' of 1848, Maisey wrote, "...the cave called Sita-sej (Sita's bed)...is excavated under the upper, and opens on to the lower portion of the rampart. 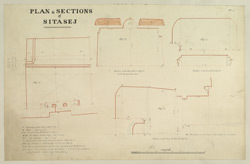 The plan and section of this cave are shown in (MS) Plate I. It is entirely hewn in the solid rock, the mark of the chisel being apparent throughout; the side opposite the entrance is occupied by a stone couch and pillow on which Sita, the wife of Ramachandra, is supposed to have slept; the roof is of very curious formation, being cut into vaulted shelves or cupboards on each side of the centre, vide fig. 3 P.P. These shelves occupy about half of the roof, O.R. fig. 2, and the remainder O.S. is plain. The door, J has plain pilasters on each side, and square holes, f f , above and below, seemingly for posts to bar up the entrance. There are several inscriptions on the stone bed...they are chiefly of 1600, and thereabout, ...".